NEW ITEM. EASY REMOVABLE MACHINE WASHABLE COVER WITH ZIPPER. NO MORE WORRY ABOUT For jumping, tumbling or just lounging around: Crash Pad is pure fun. Ideal for sensory stimulation or balance activities or just having fun playing and bouncing. Durable construction stands up to jumping and the ample foam filling makes it comfy for sitting or resting. Durable construction and ample foam filling make it ideal for play areas or reading rooms in daycare centers. 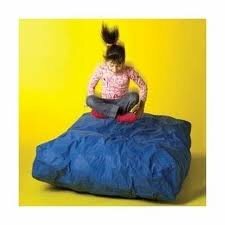 Filled with soft inviting foam is ideal for sensory stimulation or balance activities or just a great place to crash! Wipes clean and disinfects with spray disinfectant. Ships with foam compressed for reduced shipping costs. Even with compressed foam this is an oversized package. It will be shipped UPS or Fed Ex if possible. LARGE 5" X 5" CRASH PAD IS FILLED WITH IMPACT ABSORBING HIGH DENSITY FOAM AND COVERED IN LONG LASTING NYLON. PERFECT FOR BELLY FLOPS, ROLL-OVERS OR JUST STRETCHING OUT. NO MORE WORRIES ABOUT GERMS, DIRT, PET HAIR OR FOOD SPILLS. UNZIP THE COVER AND PUT INTO THE WASHING MACHINE. If you have any questions about this product by CRASH MAT CRASH PAD AUSTIM THEAPY MAT, contact us by completing and submitting the form below. If you are looking for a specif part number, please include it with your message.